Dedicated chess computers are for the sole purpose to play or analyze a game of chess. Minimalistic models provide a rudimentary, modal user interface, realized by seven-segment displays or LCD to display move-coordinates and short messages or symbols, and one or more push-buttons to enter moves or commands, and to switch modes. Most commercial dedicated board models, provide a sensory board to recognize moves, and light-emitting diodes to indicate coordinates of a move to be made by an operator on behalf of the computer. 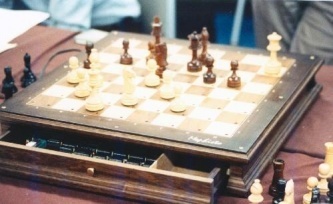 The first dedicated chess computer was the Chess Challenger 1, designed and created by Sidney Samole and Ron Nelson, sold by Fidelity Electronics since early 1977. In the 80s, modular systems became quite popular, to make the game playing core component exchangeable and easier and cheaper to update, while leaving the device appearance identifying parts and user interface the same. In the 80s and early 90s, there was a competitive market for strong dedicated chess computers, and they dominated the early computer chess tournaments dedicated for mikroprocessors. Mephisto Montreux was the last and lonesome competitor of its genre at the WMCCC 1995. Today, most dedicated units sold are of beginner and intermediate strength, and have to compete with mobile phone chess programs, for instance engines for Android or iPhone. A trend driven by collectors and enthusiasts of exclusive chess board computers, is addressed by Ruud Martin and his company Phoenix Chess Systems with the Mephisto compatible Resurrection and his own complete system Revelation.